The memorial flag as back decoration for the rebuilt floats called "yama" or "hoko" owned by the Koiyama Town. In early summer 1988, Mr. Yasuzaemon Noguchi, the Koiyama Town chairman at the time, visited me suddenly. He requested flags as a commemoration of the rebuilt "Miokuri" (as a decoration for the backside of the yama or hoko), which had taken a decade to complete. I accepted his order. His house in Chukyo was moved from Fushimi. It was the mansion owned by famous tea master Enshyu Kobori. It's a cultural treasure of the city of Kyoto. He showed me things for the Gion Festival; a Sensu or Uchiawa(fan), Tenugui(hand towel) painted by Koiyama and scripts written by famous historical artists such as Seiho Takeuchi and Bakusen Tsuchida.I felt these materials showed the splendor of Kyoto's culture. As I learned about Kyoto's very rich history I was surprised by Mr.Noguchi's modern idea, to support one of Japan's three greatest festivals by ordering a memorial flag.Because I saw him supporting one of Japan's three greatest festivals. So then I braced myself. The first Miokuri was finely woven at Bacharach Brussels, Belgium, in the 16th century. The original was sold to help the vicitms of Tenmei's Famine. 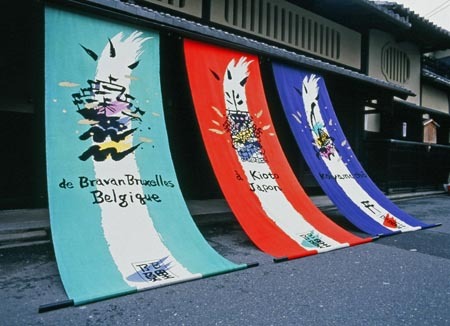 Mr. Noguchi ordered a flag design that displayed the history of Miokuri, from Brussels to Koiyama, Kyoto. A set of three vertical flags were completed, and were placed in front of the Noguchi House. Inside the house, he had an announcement party. Mr. Noguchi said that every year he cheers himself up for the festival. Two years later, on the evening of the Zyunkoh (parade), he died in hospital. He showed the spirit of the people of Kyoto through his life. I appreicated meeting him and I get a heart-warming feeling when I hear "Kon-Chiki-Chin." Because he was cheered by the "kon-chiki-chin" sound of the Gion Bayashi drums.